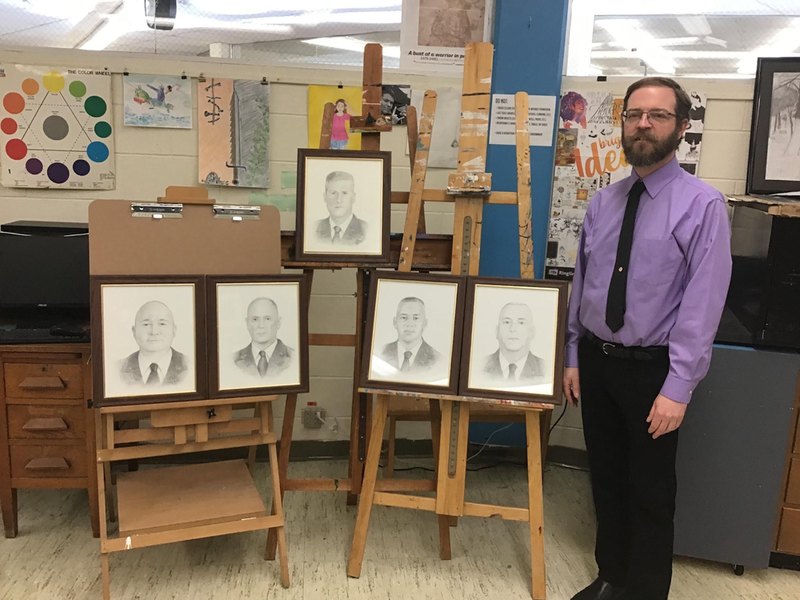 Matthew Leahy, Hiawatha High School art teacher and one of the newest additions to the faculty of HHS, is making huge impacts not only on his students, but also in the Hiawatha community. Leahy was asked by the Commander of the 2nd battalion of the 136th regiment of the Army National Guard to create some drawings of past and present commanders. These commemorative drawings have been a tradition for the local Guard and will be displayed at the armory. Leahy was commissioned to have the portraits done by Veteran’s Day. Being an art teacher new to secondary education, currently attending Emporia University to receive his secondary educator’s license, as well as having a life at home with two young children, might leave one wondering when he would have time to do this. “I worked ahead of schedule essentially. I could not procrastinate on this project,” said Leahy. He explained that time management played a huge part in this project. This was one of the very few projects he has completed that ran so smoothly, he explained. Leahy did not expect to get so much attention for this project. “I just wanted to do a nice job, and have the army personnel be happy with it,” he stated. He then expressed how honored he felt to have been asked to do this project. Leahy is hoping to impact his students through completion of the project. He explained that he brought these drawings into class to show some students. He is hoping it will help students with grey ranges and many other things. Leahy got the inspiration for this project simply by being asked to do this. He did say that he wanted to be involved in the community and continue to do art work. He still has one more drawing to finish, due in May of this year. He is hoping to bring it in to show his students to help with their artistic differences. The regiment made a donation to the art department, which Leahy is planning to use to purchase new art supplies and anything that will be used in his art classes. He is very excited to be a part of the long standing tradition held by the armory personnel.